It started with a text message from my son. He was looking for “our family’s immigrant story” for a college class. “Which one do you want?” I asked him. “Bohemian, Irish or Polish?”. I fired up my database program and sat down to write a quick story about my great-grandfather John Reilly’s voyage to America. Then something strange happened. I noticed a date. Actually a year. 1905 to be exact. 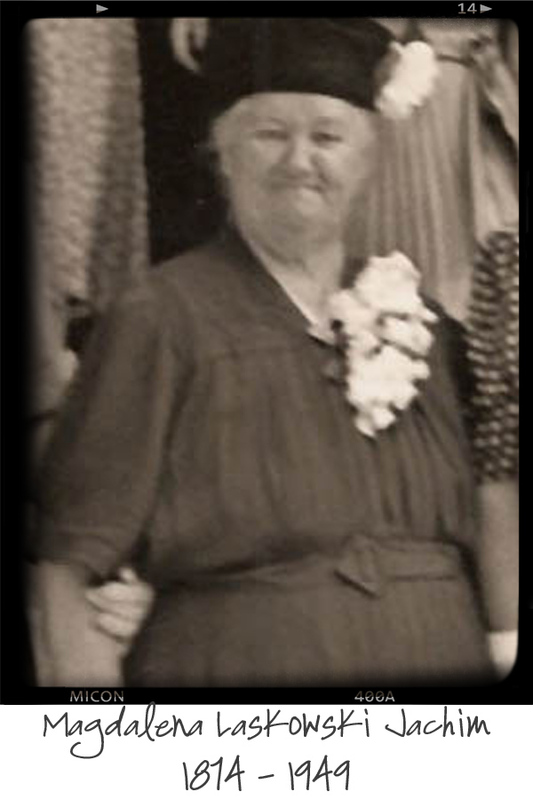 The year John Joseph Reilly left Dublin, Ireland and traveled to America courtesy of his aunt Alice Cusack. I’ve written about John’s travel to America before. I’ve known about his 1905 ship passenger record for about 10 years. But until just four days ago the date never clicked for me. If John Reilly traveled to America in 1905 that means he was living across an ocean 4,000 miles away in Chicago, when his father Andrew Reilly died in Ireland in 1908. Ten years ago this little fact did not stop me in my tracks. But now after losing my own father this past year, it did. My reaction to this find was both emotional and exciting. Emotionally because I could now offer some empathy to the great grandfather who only shows up in the margins of my memory. Did John mourn for his father? Did he feel guilt at not being with his mother and siblings as they mourned? Six short years later John named his 1st born son after his father. No doubt a common Irish tradition, but in this case it is also a poignant reminder of his father buried in Ireland. The excitement I felt after this discovery was due to the possibility of finding some missed genealogy clues. Did John return to Ireland for his father’s funeral? If so, there could be more ship passenger records to find. Or possibly a passport application. Was there mention of Andrew’s death in a Chicago neighborhood newspaper? What about the correspondence between John and his family? Does that still exist? I guess that is what family history is all about. Uncovering the questions and facts that make up our unique story. I’ve said before that it’s amazing how much one can learn by thoroughly examining a genealogy record in your possession. If your like me, the documents themselves aren’t enough. Another case in point is my recent examination of the death record of my great-great grandfather Anton Liska. I’ve had a copy of this death certificate for many years but due to the “genealogy do-over” project which encourages researchers to re-evaluate their sources, I have discovered not only a family story, but another resource for finding the death records of elusive Cook County ancestors. Death record of Anton Liska. January 1905. Anton Liska died on January 21, 1905 at the Cook County Infirmary at Dunning. At the time of his death, the conditions at the Dunning Poorhouse, Infirmary and Asylum had attracted the attention of the press who were demanding that the Cook County Board of Supervisors do something about the deplorable conditions at Dunning. Chicago Daily Tribune. Feb. 14, 1904. 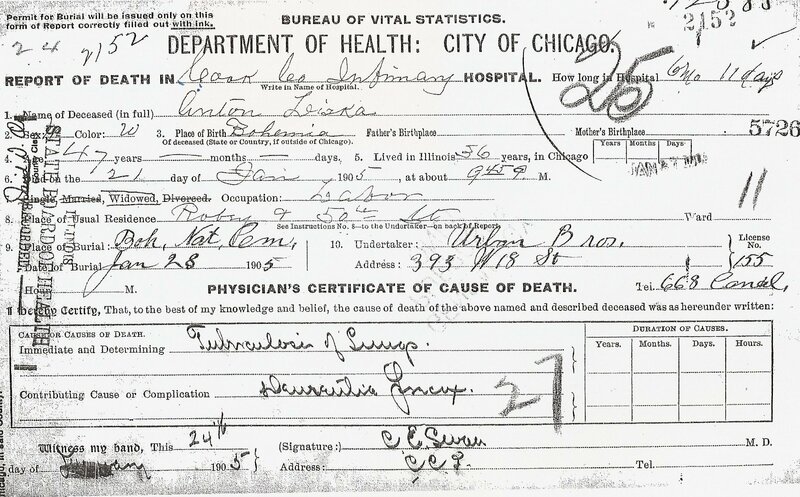 Looking closely at Anton Liska’s death certificate we can see that he spent 6 months and 11 days in the Infirmary with the cause of death being Tuberculosis of the Lungs. 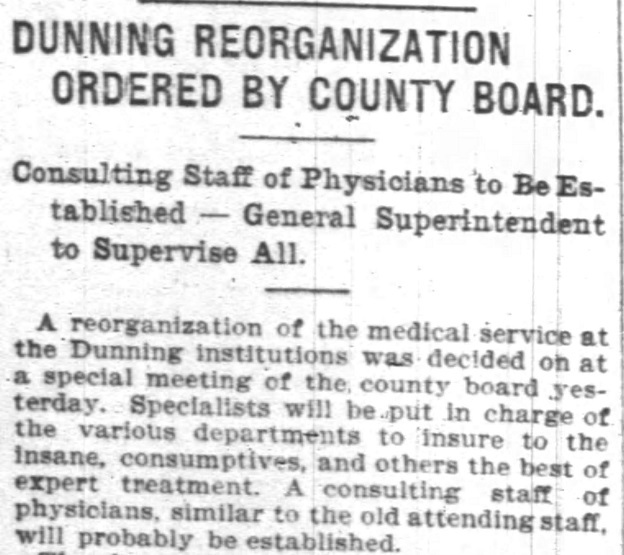 An outcome of the Chicago Tribune’s attention to the conditions at Dunning was the Cook County Board’s appointment of Dr. V.H. Podstata as general superintendent. Chicago Daily Tribune. May 29, 1903. 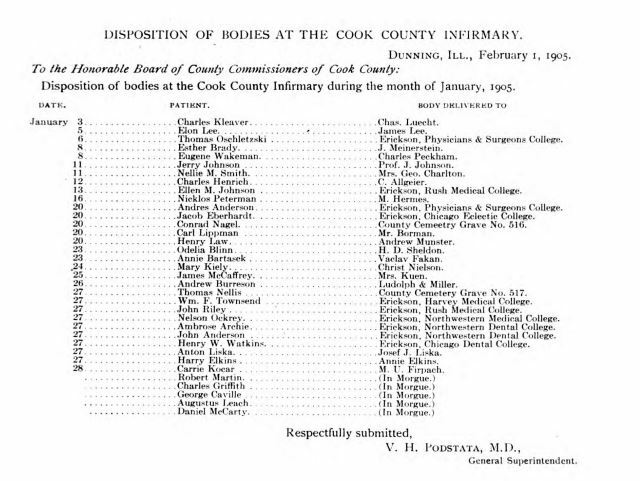 Thanks to the University of Michigan, researchers can now read Dr. Podstata’s monthly reports to the County Board in the Official Proceedings of the Board of Commissioners of Cook County, Illinois. The reports are an accurate accounting of the monthly population of patients, hospital expenditures, and the final disposition of bodies from the Cook County Hospital for the Insane, the Cook County Hospital for Consumptives and the Cook County Infirmary. 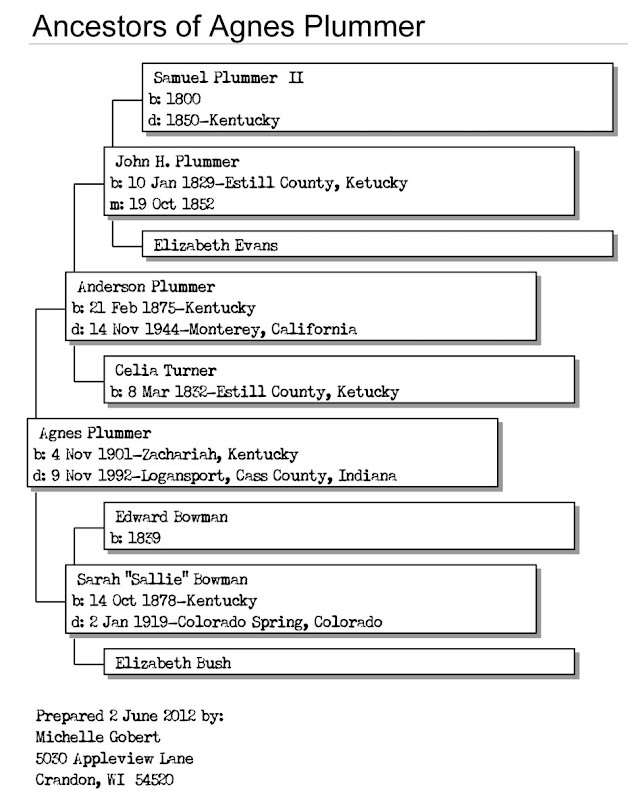 And for those of us who research our family’s stories, it is this listing of the final disposition of bodies that connects us to this place and time. It allows us not to just see our ancestors name on a government report, but rather it allows us a more thorough glimpse at the individuals who he came in contact with during his last days on earth. Anton died on Saturday, January 21st, 1905 at the age of 47. His body was delivered to Josef J. Liska, his brother, six days later on January 27, 1905. His funeral was held the following day at 11:00 a.m. with burial at the Bohemian National Cemetery. 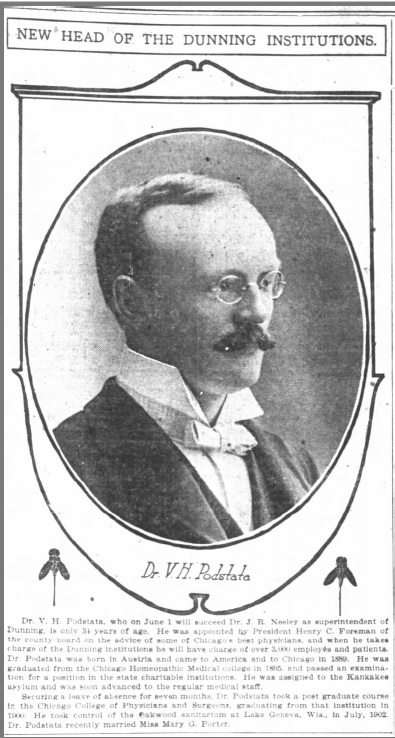 His obituary, alluding to the broken heart of his family members, appeared in the Denni Hlasatel on January 27, 1905. It’s amazing how much one document can tell you about the past! This week I’ve been slowly entering information into my database about the Frank Krivanek family. This family, while not my direct line, has however had a direct and powerful impact on my personal life, as the three daughters of Frank and Anna, Bess, Bernice and Anna, were my father’s beloved “aunts”. And while I never met them personally, their love and respect for my father after the death of his own parents in 1963, helped shape him into the wonderful father and grandfather that he was. 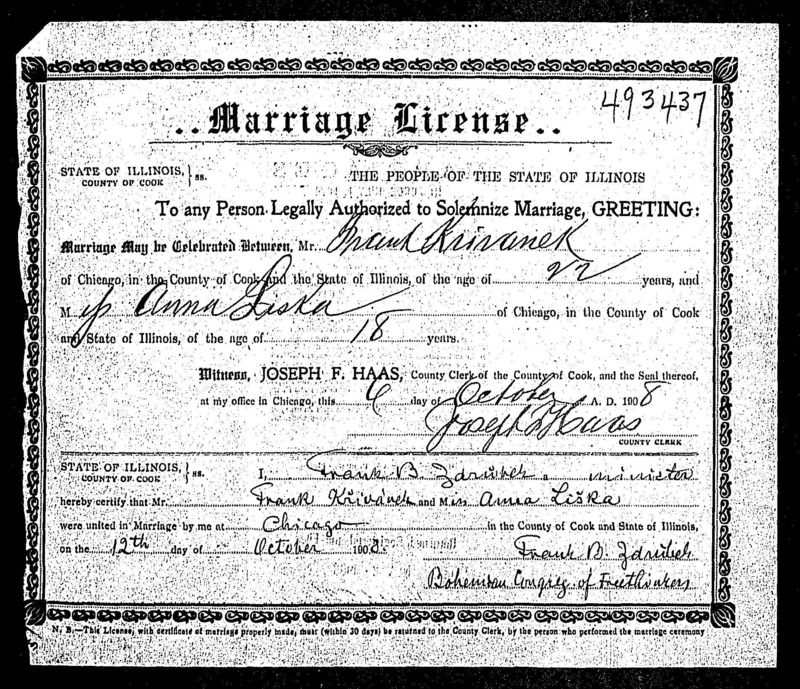 The marriage of Anna Liska to Frank Krivanek took place in Chicago on Monday, October 12, 1908. According to document, the couple received their license to wed the previous Tuesday on October 6th from Cook County Clerk, Joseph F. Haas. The marriage ceremony itself was performed by Frank B. Zdrubeck, Pres. and Minister of the Bohemian Congregation of Free Thinkers. 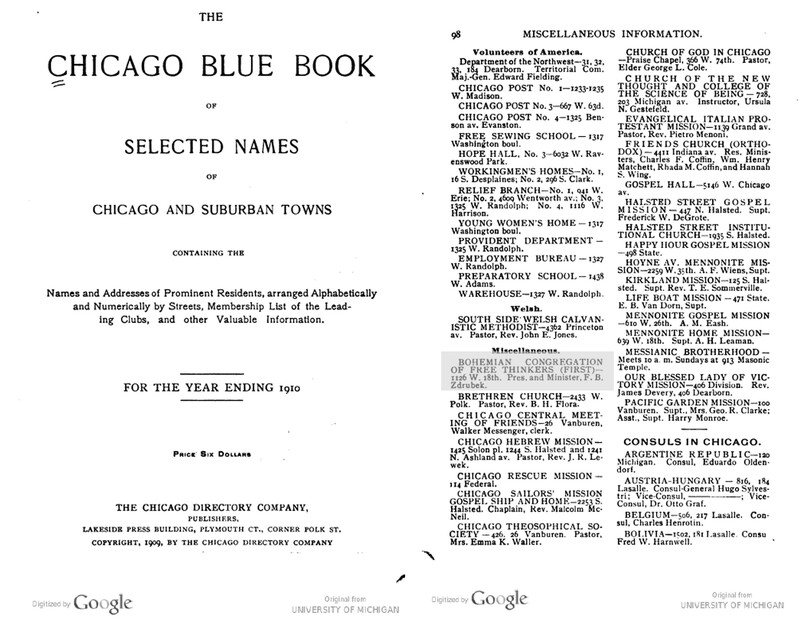 According to the 1910 Chicago Blue Book of Selected Names of Chicago and Suburban Towns, the location of Zdrubeck’s congregation was 1126 W. 18th Street. Interestingly enough, studying this document allows me to recall a conversation I had with my father at one of our lunch dates in Crandon. At that time, I was researching my great-grandparents John and Antonette Liksa Koranda, and I asked him if he knew the reason why John was not married in the Catholic church like his brothers and sisters were but rather by the Cook County Justice of the Peace? Dad was not sure. But now I wonder if Antonette and his sister Anna, were possibly members of the Freethinker Congregation? Or if not actual members, questioned the established beliefs of the Catholic Church? There is always more research to be done! From the Johann Gobert photo collection. My lofty goal of writing short biographies of each of the chosen 52 ancestors is proving to be more difficult than I first thought. Why? Well, this week the ancestor I chose to write about is Matilda Peterson Gretzinger, my husband’s great-grandmother. However, when I went to her record in my database, I found it incomplete. Very little data with incomplete citations. Not even her obituary. Which leads me to my current state of frustration. Is the mission of this 52 week challenge supposed to allow me to highlight 52 ancestors or is the mission supposed to point out holes in my family tree which essentially leads to more in-depth and properly cited research? Since this is my blog and my challenge, I choose both! Matilda Peterson Gretzinger was born in February of 1889, the daughter of John and Anna Peterson. The first record I have of Matilda is the 1900 census in which she is living in the Town of Matteson in Waupaca County, Wisconsin. She is eleven years old and is listed as being “at school”. Other members of the household include seven brothers & sisters and one half-sister, Mary Euhardy. (Mary was the daughter of Peter Euhardy, Anna Hormish’s first husband). 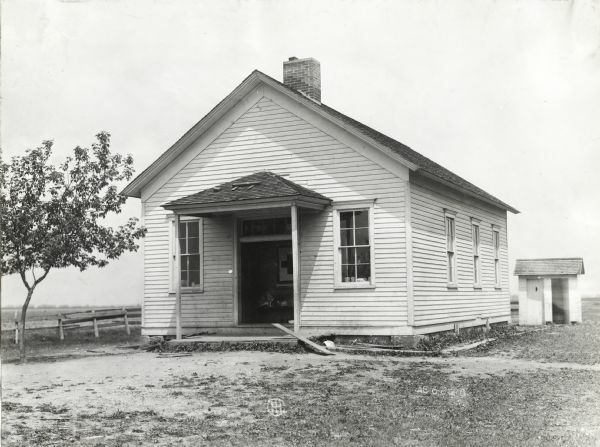 At this point I don’t have detailed information on the Peterson family’s life in rural Waupaca county in 1900, but we do know that Matilda’s father was a farmer and more than likely his children attended a one room school with farm chores to keep them busy at home. Jump ahead ten years to the 1910 census and we find Matilda still living in Matteson, Waupaca County with her parents and siblings. Her older sister Anna is not living with the family, nor is her half-sister Mary. We can only assume that they have married and have families of their own. Speaking of getting married. In 1910, at age 21, one has to wonder if Matilda has yet met the handsome John Gretzinger whom she will marry two years later at the age of 23? Source: Memories of Forest County. Wisconsin State Historical Society. 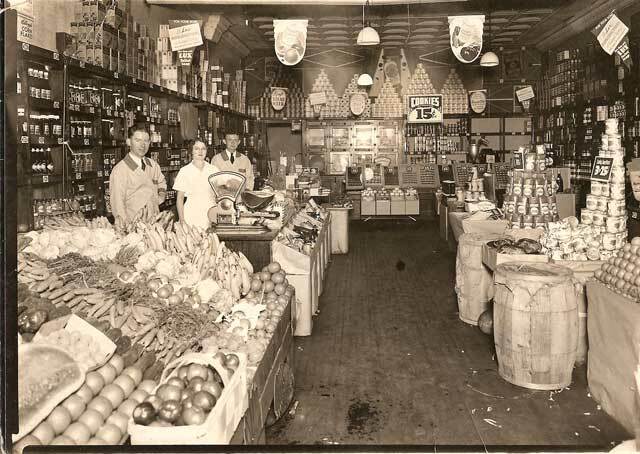 Shortly after their marriage, John and Matilda moved to rural Forest county and started their own family farm. By 1920, the family has grown to include children Dorothy, Roy, Earl and Ann. The exact location of the farm enumerated in 1920 is not known. It appears that the farm was enumerated on Range Line Road in the Town of Crandon with the Gretzingers nearest neighbors being the Ernest Feight and Isaac Dehart families. Whether this location was the “old farm” now located on Linneman Road remains to be seen. In 1942, John and Matilda returned to Clintonville, eventually making their last move to Shawano a few years before Matilda’s death in 1961. They are buried together in Graceland Cemetery in Clintonville. I’m a big fan of well-written historical fiction. It’s how I learn history. No dates or names to memorize just characters to meet. I’ve been searching for a historical fiction title that tells me a little bit more about the history of Poland since I am clueless about the country’s leaders and peoples prior to WWII. I found the book titled Push Not the River by James Conroyd Martin. I’m about half way done with the book and I’ll save my review for later; however, each chapter of the book starts with a Polish Proverb. It was the proverb found in the Prologue that prompted me to write about my ancestor Magdelena Laskowski Jachim. you can never leave yourself behind. Magdalena Laskowski Jachim was born in Liverpool, England about 1874, the daughter of Michael and Katherine Laskowski. She married Josef Jachim (also spelled Yockem) in Liverpool in 1889 and they emigrated to the United States in 1893. This clipping shows the Yockem (Jachim) family arriving in the United States via the port of Philadelphia in April of 1893, They are traveling to meet Maggie’s sister Frances Wrabel in Chicago. Even though Magdalena was born in Liverpool, England, I consider her a Polish ancestor. According to my research, her parents left Poland shortly after her oldest sister Frances was born in Poland. The family lived in the neighborhood of Toxteth Park in Liverpool for approximately 20 years as Polish immigrants. 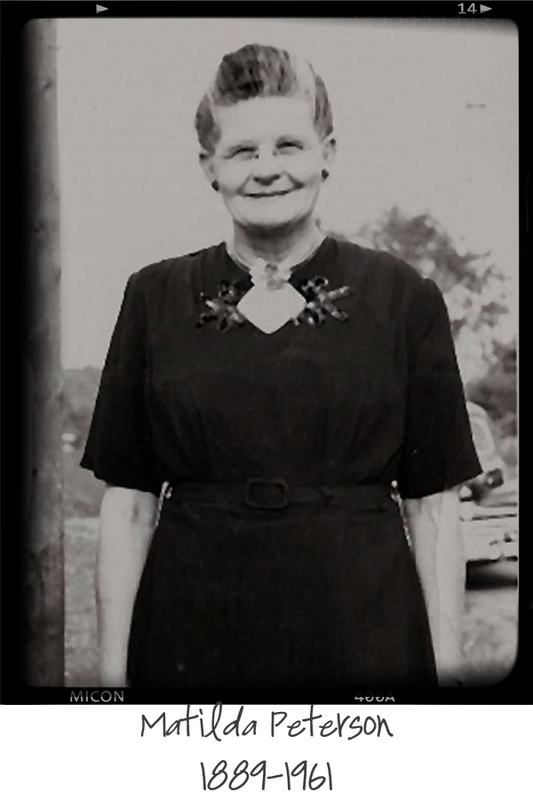 T his photo was taken at her granddaughter Clara Cygan’s wedding to Frank Koranda. My father only remembers a brief visit to his great grandmother Magdalena’s home even though she lived until the age of 75 passing away in August of 1949 when he was seven years old She is buried in St. Adalbert’s cemetery in the town of Niles in Cook County, Illinois. I’m up for the challenge. If you review this blog you will see that I am very hit or miss with my postings. And if I’m honest its more miss than hit. But this morning while reading the Ancestry.com blog I got kinda excited. Why? Because I already started this challenge and didn’t know it! 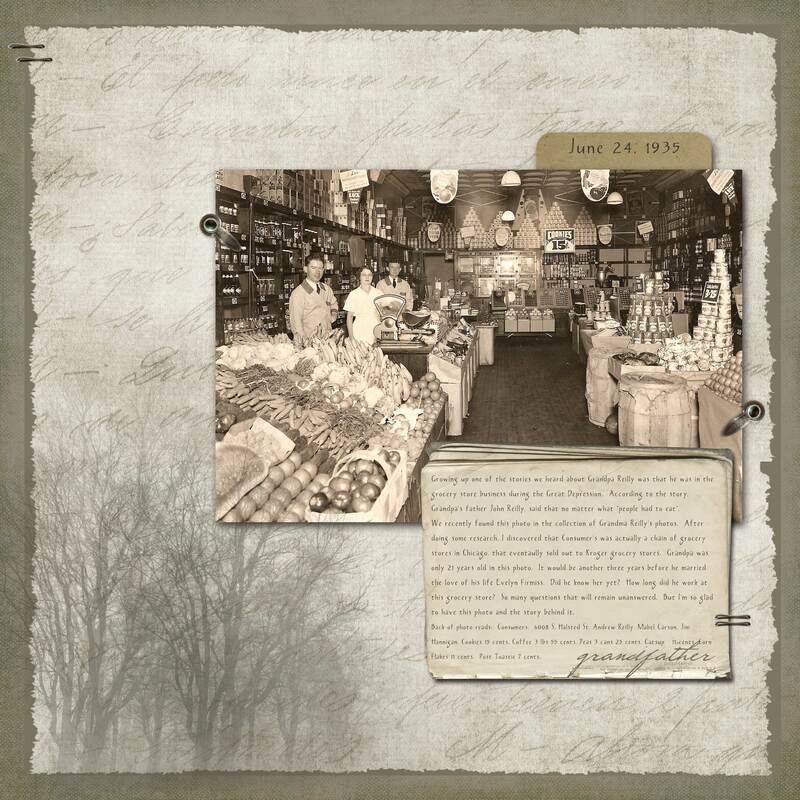 One of my other passions is Scrapbooking and lately I’ve been creating heritage layouts that include photos and information about my ancestors. Which is exactly what I need to do with this blog! So there it is. I’m going to take on the 52 week challenge but not only am I going to blog about my genealogy pursuits, but I’m going to create scrapbook pages to go along with the blog. At the end of 2014, I will have shared with my family information about 52 of our shared ancestors (one of the reasons why I blog) and I will have at least a 52 paged heritage scrapbook! I am not overwhelmed. I am not overwhelmed. I am not overwhelmed. Agnes and Asa Plummer were the children of Anderson Plummer and Sallie Bowman, making them the grandchildren of John and Celia Plummer. The same generation as my husband’s grandfather Harden. So did Harden have a great-grandmother that lived to be 105+ years old? Or was it a maternal grandmother? A Bowman ancestor? Either way I have to dust off my Kentucky sources and dig in! To begin with I had to look at Agnes Plummer’s ancestral chart to determine what I already knew about her great-grandparents. Turns out I don’t have all eights of Agnes and Asa’s great-grandparents documented in my tree. Edward and Elizabeth (Bush) Bowman. I think this might be the genealogy puzzle I’ve been looking for! I’ve been wondering for some time how to share my genealogy work with everyone that is more than just an ancestral chart. The search for death information on all four of Agnes and Asa’s great grandmothers might be the key. Suspect #1: Elizabeth Evans Plummer. The mother of John Plummer. Let’s hope I don’t get distracted by those darn Chicago ancestors of mine! 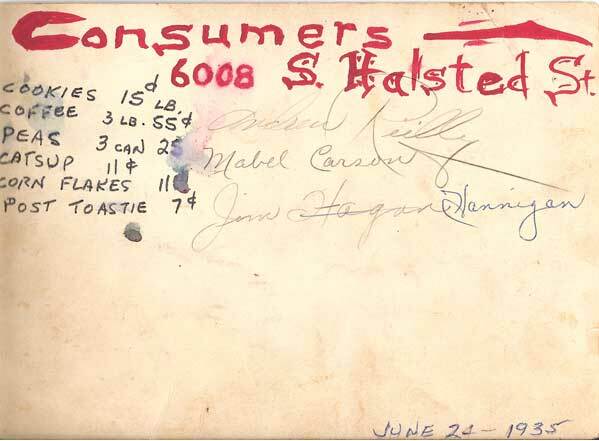 While these two obituaries are not in my family tree, I was intrigued by the Chicago history found within this blog post. I became hooked when I discovered the tie between Chicago and Norway, Michigan. The search for the two Frank Cygan’s has put me over the edge. The Frank Cygan with the birthdate that matches the Polish baptismal records, unfortunately lists his birthplace as Illinois on every document I find of him. Grrr. Now I know that he may have fibbed a bit to the census taker and to the draft board, but I’m not anywhere near closer to being able to prove he is a brother to my great grandfather Nicholas Cygan. So I’m putting him aside for awhile. And I’m moving on. And since I have nothing better to do (laundry, dishes, etc.) to do, I’ve decided to play around with Chicago church records.